We’ll review/discuss the process and results. 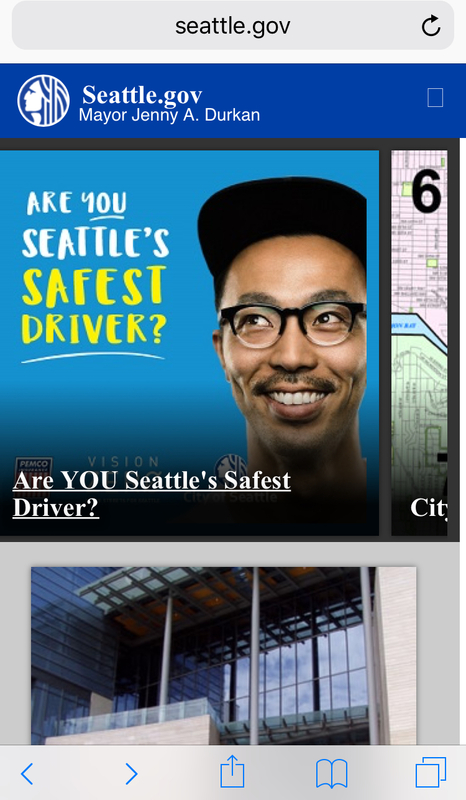 Now, go to Seattle.gov on your computers and poke around, explore. THEN do the same thing on your phones! Ask yourself, when might people be accessing the site from a phone, when from a computer (what tasks)? After you’ve spent a little bit of time on the site, write a one or two sentence statement of purpose/mission statement for the website. Do you need a different mission statement for mobile from desktop? I’d like you to post your statement in Slack, please (channel is #in-class-18jan). We’ll pair-and-share and then talk as a group. How do these two exercises help you (a) think about the audience for the website and (b) consider what the users want from the site, both when accessed on desktop and mobile? Watch this YT video about SMART goals. Find at least two government websites that might be considered “competitors” — in this case, not literally! The government body should be similar in scope (think population – 700,000 – and services). Post your competitor links on Slack as a separate entry (but the same channel). Take about 15 minutes to look at the four student sites in on our staging area page that have completed the assignment. Think about how your peers approached the assignment, relative to how you approached it. In small groups (three) discuss the different approaches – whether in terms of design, reasoning or type of site (genre). What did you learn? For the next 30 minutes, work on your project. Card sorts started with 3×5 cards and have evolved to be online instruments. The words on the cards should reflect tasks, not navigation. Each task statement should be as short as possible (pay property taxes, register for WEB200). Be careful not to overuse verbs/words or you will unintentionally guide participants towards a sort order. A card sort of 30-45 tasks is usually sufficient, and you can print these by hand on 3×5 cards. If you need multiple sets of cards, print to labels. You can also use sticky notes, but they are harder to keep in groups after a sort. How will you logically nest pages? Make sure that there is a logic to nesting (avoid making sites too “deep”). Consider the inverted pyramid when structuring both pages and sites. Page names should be “generally specific”—meaning the names should be concise, yet broad enough to be meaningful to the user. No spaces in file names – hyphens are preferred for SEO. All lower case (some servers are case sensitive).